the organisation that represents a number of mainly rural touring schemes and rural arts development agencies across England and Wales. Our touring scheme members work with local communities to promote high quality arts events and experiences in local venues. 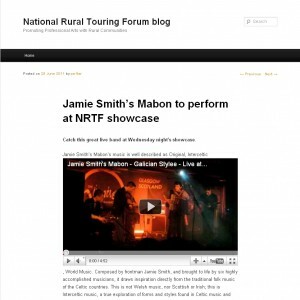 Just wanted to say a quick word about one aspect of my work which is the new NRTF blog at nrtf.wordpress.com. Part of my brief was to help the organisation to help its members in the use of digital media when organising gigs and events in villages and rural communities. While already equipped with a website I thought there was a need for somewhere where we could quickly post news, videos, images and notes from the conference. We also wanted to allow comments and sharing of the posts around the web. We had to get it online quickly in time for the beginning of the conference. So this time I opted to use wordpress.com. The blog could have been hosted and accessible from their main domain, in the background running WordPress code from wordpress.org. I am no stranger to installing WordPress code, running completely independently, with all the customisation and design flexibility that brings. But rather than spend time discussing and planning that and going back and forth with visual design and other issues, I just set the blog up on wordpress.com and added some team members as users so they can post. I think far too often people agonise over all kinds of comparatively small issues (branding, design tweaks, everything under one domain, what could be possible with the technology) at the expense of the THING which just has to be DONE and available. In the long run we can still do many things. Maybe we want to lose ‘wordpress’ from the address to have a more branded name – but make sure any inbound links don’t break. In that case we can use WordPress’ paid service to redirect a subdomain (such as blog.nrtf.org.uk, just an example) to the blog on Automattic’s company servers. Any visitor will not know any differently, other than the neat domain name. Alternatively, if NRTF build a new website (hopefully using an open source system such as WordPress itself or maybe Drupal) they might decide to include a blog as a section. In that case we can export the content from the posts on the existing WordPress blog and import them on to the new website. Unlike many other web services, WordPress is very good at letting you export your data and move it elsewhere. (Dear web services: if you love someone, please set them free.) We could post one final entry on the existing blog with a link to the new home and a brief explanation. Or we can just carry on with the blog as it is. I’m happy that the NRTF team are up and running with a blog, which is probably the quickest way to publish long-form content on the web. They also have freedom, they are not locked into this system, which is important. The annual gathering of NRTF is about to start in Caerleon, Newport. The hashtag is #ruraltouring. I’m doing three presentations and a social media surgery. So I’ll be pretty busy – but please make sure you say hi to me if you’re attending!